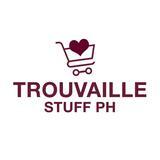 @trouvaillestuffph is on Carousell - Follow to stay updated! Semi-long sleeve top with button If through courier, the fee is charged to client. Brown Don't change the mountain shirt. If through courier, the fee is charged to client. Medium-sized gray top. If through courier, the fee is charged to client. Medium-sized white sleeveless top. If through courier, the fee is charged to client. Medium-sized peach top. With extra button. If through courier, the fee is charged to client.